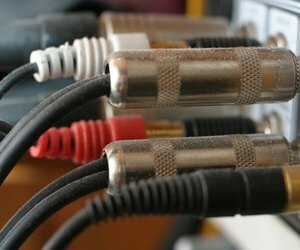 One way is that connecting all media components to your TV using an Optical Cable. 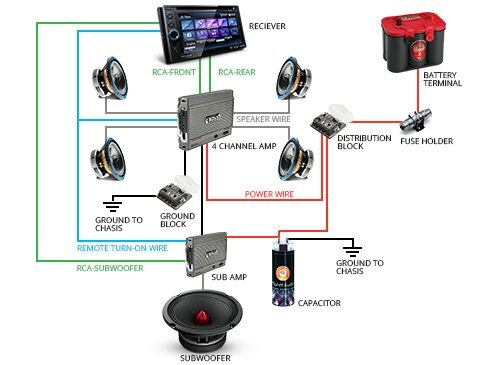 And the other is connecting all audio and video components to the soundbar. The first way is easy to connect �... If the equivalent speaker impedance is higher than the amplifier output (e.g. connecting an 8 ? speaker to an 4 ? amplifier output). then the output will not be as loud as it could be If you are connecting up more than one speaker to an amplifier, then you can create a network of parallel and series speaker connections to keep the impedance equal to or higher than the amplifier output. I think the general rule is that for parellel connections the impedence is halved, and for series it is doubled. So, assuming you have 8 ohm speakers, connecting any 2 �... If all you have is one subwoofer, it's easy: feed it from the Subwoofer or LFE (low-frequency effects) output of your preamp or receiver. Set your preamp or receiver to "Small" for your other speakers. In skype, you can change the audio output, but most programs doesn't have that feature, so they just output into the default windows sounds. I can change the audio input on OBS, but I can't set it to Spelunkys sound because it's mixed with the rest of the sounds.... Yes jgatie, but I already have the speakers sadly. And anyway, I want two speakers - one in the wardrobe (originally to be attached to the L speaker posts) and one in the bathroom (attached to the R speaker posts), both outputting the full signal, exactly as I would if Sonos had a mono output. I have two passive bookshelf speakers Micca - MB42X and would like to use a single amp to send the same audio signal to each speaker. I do not want one speaker to receive the left channel and one to receive the right channel; I want them both to receive mono. To disable your TV�s built-in speakers, connect the audio output from your TV to the TV Input on the CineMate system. In addition to the connection from the TV, you can also connect up to two audio/video devices directly to the CineMate system�s auxiliary inputs (AUX) to assure the best-possible sound quality from these sources. In skype, you can change the audio output, but most programs doesn't have that feature, so they just output into the default windows sounds. I can change the audio input on OBS, but I can't set it to Spelunkys sound because it's mixed with the rest of the sounds. You would most likely need to insert an amplifier between the 3.5 mm output and the speakers. If you are trying to go the other way and hook the speaker output of some device to the 3.5 mm input of another device, you are headed for heartbreak.